Tantalum is a sensible choice whenever high corrosion resistance is required. Even though tantalum is not one of the noble metals, it is comparable to them in terms of chemical resistance. In addition, tantalum is very easy to work at well below room temperature despite its body-centered cubic crystal structure. Tantalum's corrosion resistance makes it a valuable material in a large number of chemical applications. We use our "unyielding" material, for example, to produce heat exchangers for the equipment construction sector, charge carriers for furnace construction, implants for medical technology and capacitor components for the electronics industry. You can rely on our quality. We produce our tantalum products ourselves – from the metal powder right through to the finished product. As our input material, we use only the purest tantalum powder. This ensures that you benefit from a very high level of material purity. Due its particularly fine microstructure, tantalum is the perfect material for drawing ultra-slender wires with a flawless, exceptionally pure surface for use in tantalum capacitors. We can determine the chemical, electrical and mechanical properties of these wires to a high degree of precision. As a result, our products give our customers tailor-made, consistent component properties which we are continuously developing and refining. Its excellent resistance coupled with its excellent formability and weldability make tantalum the perfect material for heat exchangers. Our tantalum heat exchangers are exceptionally stable and resistant to a range of aggressors. With our many years of experience in the machining of tantalum, we are also able to manufacture complex dimensions which precisely meet your requirements. Pure tantalum - or maybe an alloy? And there's more: By using our own customized manufacturing processes, we can modulate various other properties of tantalum across a wide range of values. The result: Two different tantalum production variants and alloys characterized by different properties which precisely meet the requirements of the intended application. When particularly tough jobs beckon, our sintered quality tantalum is the solution: Due to the powder metallurgical production process we employ, sintered quality tantalum (TaS) is particularly fine-grained and pure. As a result, the material is very easy to work and excels due to its excellent surface quality and robust mechanical properties. For use in capacitors, we recommend our tantalum variant with a particularly high surface quality (TaK). This type of tantalum is used in wire form in tantalum capacitors. High capacitance, low leakage currents and low resistances can only be guaranteed using wires that are free of surface defects and impurities. Sometimes the very best isn't needed. Melted quality tantalum (TaM) is usually more economical to produce than sintered quality tantalum and provides sufficient quality for many applications. However, the material is neither as fine nor as homogeneous as sintered quality tantalum. Just contact us. We would be very happy to advise you. We dope our sintered, grain stabilized tantalum with silicon which prevents grain growth even at high temperatures. This makes our tantalum suitable for use at even the highest operating temperatures. The fine-grained microstructure remains stable even after being annealed at temperatures of up to approximately 2 000 °C. This process ensures that the material's excellent mechanical properties such as its ductility and strength remain intact. Grain stabilized tantalum in the form of wire or sheets is ideal for sintering into tantalum anodes or for applications in the furnace construction sector. Tantalum-Tungsten (TaW) excels due to its good mechanical properties and excellent corrosion resistance. We add between 2.5 and 10 percent by weight of tungsten to pure tantalum. Although the resulting alloy is up to 1.4 times stronger than pure tantalum, it remains easy to work at temperatures of up to 1 600 °C. Our TaW is therefore specially well suited for the heat exchangers and heating elements used in the chemical equipment construction field. A good all-rounder. Material properties of tantalum. Tantalum belongs to the group of refractory metals. Refractory metals have a higher melting point than platinum (1 772 °C). The energy binding the individual atoms together is particularly high. The high melting point of refractory metals is coupled with a low vapor pressure. Refractory metals are also characterized by a high density and low thermal coefficient of expansion. In the periodic table, tantalum is located in the same period as tungsten. Like tungsten, tantalum has a very high density of 16.6 g/cm3. However, unlike tungsten, tantalum becomes brittle during manufacturing processes involving hydrogen atmospheres. The material is therefore produced in a high vacuum. Refractory metals are typically characterized by a low coefficient of thermal expansion and relatively high density. The same is true of tantalum. 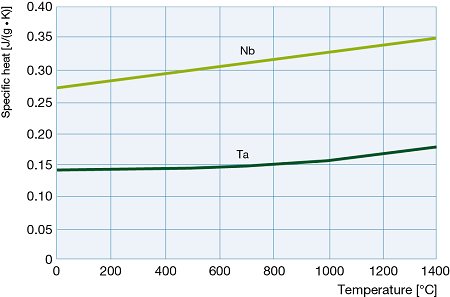 While the thermal conductivity of tantalum is lower than that of tungsten and molybdenum, the material has a higher thermal coefficient of expansion than many other metals. Even small quantities of interstitially dissolved elements such as oxygen, nitrogen, hydrogen and carbon are able to modify the mechanical properties of tantalum. In addition, the purity of the metal powder, the production process (sintered or melted quality), the degree of cold working and the type of heat treatment used also influence its mechanical properties. Like both tungsten and molybdenum, tantalum has a body-center cubic crystal structure. 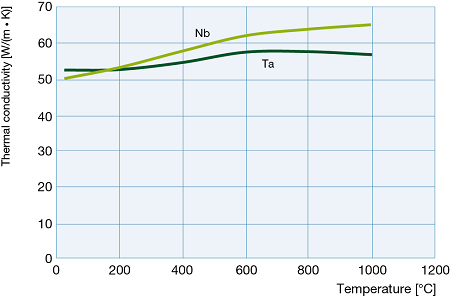 At -200 °C, the brittle-to-ductile transition temperature is well below room temperature. As a result, the metal is very easy to work. While its tensile strength and hardness increase with cold working, this simultaneously causes the material's breaking elongation to fall. Although the material loses ductility, it does not become brittle. The material's heat resistance is lower than that of tungsten but similar to the values found for pure molybdenum. To increase the heat resistance, we alloy our tantalum with refractory metals such as tungsten. Tantalum's modulus of elasticity is lower than that of tungsten and molybdenum and resembles that of pure iron. The modulus of elasticity falls with increasing temperature. 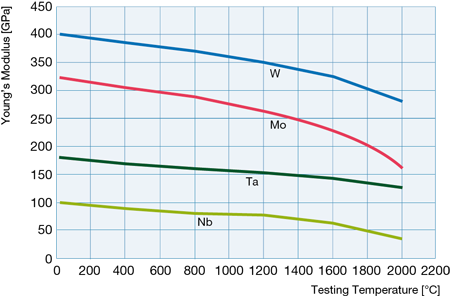 Modulus of elasticity of tantalum compared to that of tungsten, molybdenum and niobium. Thanks to its high level of ductility, tantalum is very suitable for forming processes such as bending, stamping, pressing or deep-drawing. It is very difficult to use machining processes with tantalum. The chips do not break cleanly. We therefore recommend the use of chip formers. Tantalum offers excellent weldability compared to tungsten and molybdenum. Because tantalum is resistant to all types of chemical substance, this material is often compared to the precious metals. However, in thermodynamic terms, tantalum is a base metal which can nevertheless form stable compounds with a wide variety of elements. When exposed to air, tantalum forms a very dense oxide layer (Ta2O5) which protects the base material from aggression. This oxide layer therefore makes tantalum corrosion-resistant. At room temperature, the only inorganic substances that tantalum is not resistant to are: concentrated sulfuric acid, fluorine, hydrogen fluoride, hydrofluoric acid and acid solutions containing fluoride ions. Alkaline solutions, molten sodium hydroxide and potassium hydroxide also attack tantalum. In contrast, the material is resistant to aqueous ammonia solutions. If tantalum is exposed to chemical aggression, hydrogen enters its metal lattice and the material becomes brittle. The corrosion resistance of tantalum falls gradually with increasing temperature. Tantalum is inert in contact with many solutions. However, if tantalum is exposed to mixed solutions, its corrosion resistance may be impaired even if it is resistant to the individual components taken separately. Do you have any questions regarding complex corrosion-related topics? We would be delighted to help you with our experience and our in-house corrosion laboratory. Tantalum is resistant to a series of metal melts such as Ag, Bi, Cd, Cs, Cu, Ga, Hg, K, Li, Mg, Na and Pb provided that these melts have a low oxygen content. However, the material is affected by Al, Fe, Be, Ni and Co.
Chemical reactions arise very quickly when base materials such as tantalum are brought into contact with noble materials such as platinum. You should therefore take careful account of the behavior of tantalum in contact with the other materials present in the system, especially when working at high temperatures. Tantalum does not react with noble gases. As a result, high purity noble gases can be used as protective gases. However, with increasing temperature, tantalum reacts very strongly with oxygen or air and may absorb large quantities of hydrogen and nitrogen. This causes the material to become brittle. Annealing tantalum in a high vacuum gets rid of these impurities. Hydrogen is eliminated at 800 °C and nitrogen as of 1 700 °C. In high-temperature furnaces, tantalum may react with construction parts made of refractory oxides or graphite. Even very stable oxides such as aluminum, magnesium or zirconium oxide may be reduced at high temperatures when in contact with tantalum. Contact with graphite may cause the formation of tantalum carbide and lead to the embrittlement of the tantalum. Although tantalum can usually be combined without problems with other refractory metals such as molybdenum or tungsten, it may react with hexagonal boron nitride and silicon nitride. 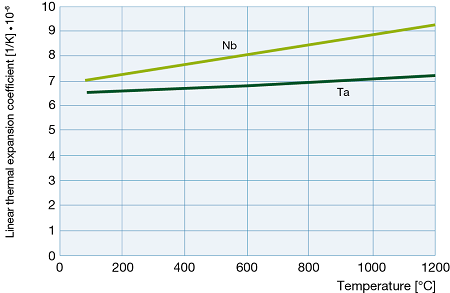 The table below indicates the corrosion resistance of the material against heat-resistant furnace construction materials. The listed limit temperatures apply in a vacuum. If a protective gas is used, these temperatures are approximately 100 to 200 °C lower. Tantalum that has become brittle can be regenerated by means of high-vacuum annealing at 800°C. In 1802, the Swedish chemist Anders Gustav Ekeberg separated tantalum pentoxide (Ta2O5) from columbite ore for the very first time. The oxide is named after Tantalos, a figure in Greek mythology: Tantalus (lat.) was never able to satisfy his thirst because the water around him always receded before he could reach it. In the same way, tantalum oxide cannot react with any acid. The chemical symbol Ta was proposed by Jöns Jakob Berzelius in 1814. Berzelius was also the first person to produce elementary tantalum. However, Heinrich Rose recognized that the tantalum produced in this way actually only consisted of 50 % tantalum. In 1844, Rose succeeded in proving that tantalum and niobium were different and distinctive elements. And it was not until 100 years later that Werner von Bolton was able to produce pure tantalum by reducing potassium heptafluorotantalate with sodium. Tantalum occurs most frequently naturally in the form of tantalite ore which has the formula (Fe,Mn) [(Nb,Ta)O3]2. When the tantalum content predominates, the ore is referred to as tantalite. When more niobium than tantalum is present, it is known as columbite or niobite. The world's largest tantalum deposits can be found in Australia, Brazil and a number of African countries. The ore is refined using a variety of methods to obtain concentrates of approximately 70 % (Ta,Nb)2O5. This concentrate is then dissolved in a mixture of hydrofluoric and sulphuric acid. The resulting fluoride complex [TaF7] is then converted to an organic phase by means of a liquid extraction process. The organic phase is separated from the aqueous phase. The tantalum is then separated from the organic phase using potassium hydrogen fluoride. This process produces potassium heptafluorotantalate (K2TaF7). The tantalum compound obtained in this way is then reduced with sodium in the chemical reaction below to produce pure metallic tantalum. So what is powder metallurgy? It is well known that nowadays most industrial metals and alloys, such as steels, aluminum and copper, are produced by melting and casting in a mold. In contrast, powder metallurgy does away with the melting operation and the products are manufactured by compacting metal powders which are then subjected to a heat treatment (sintering) below the melting temperature of the material. The three most important factors in the field of powder metallurgy are the metal powder itself as well as the compacting and sintering operations. We are able to control and optimize these factors in-house. The tantalum powder is mixed with alloy elements and then filled into molds. The mixture is then compacted at pressures of up to 2 000 bars. The resulting pressed part (also known as a "green compact") is then sintered in special furnaces at temperatures of over 2 000 °C. During this process, the part acquires its density and its microstructure forms. The very special properties of our materials - such as their excellent thermal stability, their hardness or their flow characteristics - are due to the use of the appropriate forming methods, for example forging, rolling or drawing. Only when all these steps dovetail perfectly can we achieve our exacting quality demands and manufacture products of outstanding purity and quality.